26 | April | 2018 | Azazel's Bitz Box. Regular readers will know that I’m a bit of an Oldhammerer, and I’ve got a decent collection of the original Realm of Chaos models, including beastmen of the chaos dieties, and even some of the Beastman Champions of Chaos models. 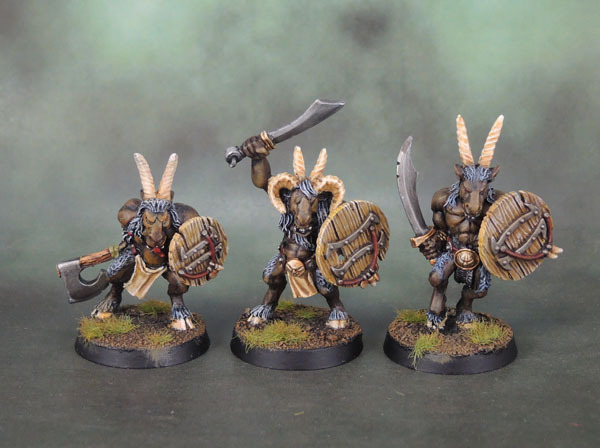 As much as I love those older models (many sculpted by Jes Goodwin), my favourite series of Beastmen that were sculpted in a consistent manner are Michael Perry’s line of goat-headed models, initially sculpted and released in the mid-1990’s. 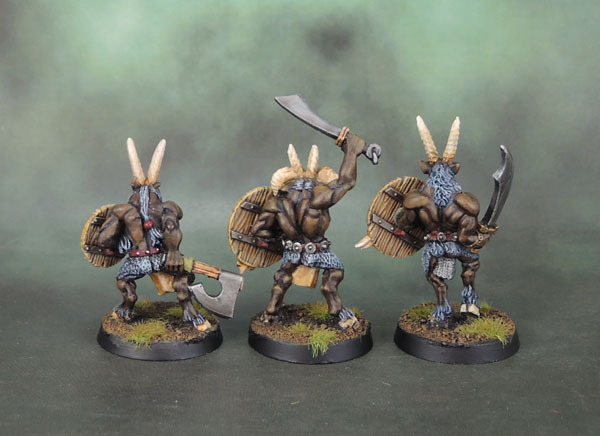 These models were later specified as “Gors”, and joined by Ungors, Bestigors, Centigors and so on – as they became the template of all non-specifically-aligned beastmen in Warhammer lore right up to current times. While the recent return of Tzaangor were a welcome release, and we await Khorngor and Slaangor (and wonder what happened to the anticipated Pestigor), these have become the archetypical Games Workshop Beastmen – and yes, they’re still pretty much Broo in their heritage and lineage. Shields are taken from the later, plastic line of beastmen. I like those models a lot as well, though not as much as these earlier metals. 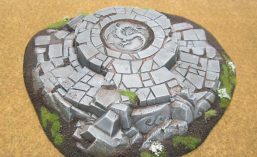 Their shields, however are perfect for these and convey a nice, wild and feral feel much more effectively than the standard plastic shields of the day. If it were next month, these three would count as Neglected Models. I don’t remember when I started them, or even why. But April has been a tough month for painting motivation, and I’ve not gotten a whole lot done. Certainly nothing like I’d planned. I’ve assembled a bunch of smaller models, rather than something especially large and impressive – and worse – nothing that I really want to show off or share here on the blog in their current states. So turning to a few older models still sitting on the desk and getting them complete has at least given me the chance to feel a little bit productive.